The Joint Center for Housing Studies of Harvard University predicts that in the next five to 10 years, home automation will become the second most sought-after trend in residential remodeling — and given the convenience, efficiency, and peace of mind it provides, it's not hard to see why. 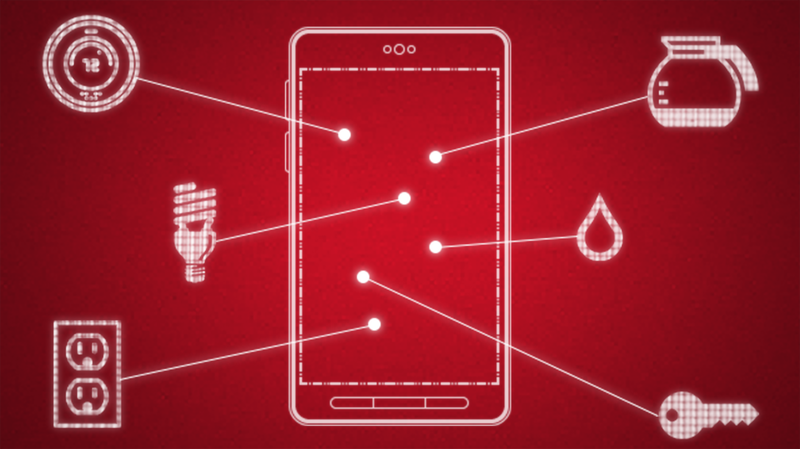 With leaders in innovation like Verizon Wireless recognizing its potential, the future of auto-dimming lights looks... brighter than you'd imagine, actually! Here are the ways automation is making itself at home. It's normal to freak out about the state of your home at any given moment. Did you unplug the iron? Lock the door? Leave your kid at home while the rest of your family flies off for a Christmas vacation in France? Automation is the best friend a homeowner can have when it comes to safety — especially an absentminded (or paranoid) homeowner. Verizon Home Monitoring and Control uses Z-Wave technology to power a comprehensive home automation system. You can turn off selected appliances (like that pesky iron), saving you from burning down the house while you're at a business lunch. You can also lock (or unlock) doors and check in on your home remotely by activating cameras — you know, just in case your kid is rockin' around the Christmas tree with a cut-out basketball player and you feel like embarrassing him at his wedding someday with video evidence. For additional safekeeping, Honeywell has security offerings that'll keep you covered both inside and out. Their sensors can protect your home and valuables by tracking movement on your front porch, in your backyard, and anywhere indoors. They can even detect the sound of broken glass. Warnings of potential shadiness will be sent straight to your smartphone, as well as security professionals who provide 24-hour monitoring. Tweaks to behavior like turning off the lights when you leave a room and swapping out chemical household cleaners for plant-based alternatives are simple ways to green up your household, but home automation makes it easier than ever to keep your energy use on the efficient side. Keeping the lights dimmed at 50% rather than lit at full capacity can make your bulbs last 20 times longer than average. And heating and cooling, when left unchecked, typically make up 56% of your energy bill — only because most people aren't manually adjusting their thermostats every time they leave the house. Verizon Home Monitoring and Control, in addition to its security capabilities, allows you to remotely adjust your thermostat, dim your lights, or turn them (and other appliances) off completely. If you're unsure of which energy-sucking appliances are unnecessarily left on in your home, the system can also point out where and when energy is being wasted. Of course, there's another side to home automation. One that can turn entire rooms into immersive touchscreens, allow you to monitor your garden without stepping foot outside, and queue up your favorite playlist when it knows you're approaching the front door. But not every product is all play and low utility. The forthcoming WeMo-enabled Crock-Pot SmartSlow Cooker, for instance, will allow homeowners to turn on and adjust settings on their crock-pots from their phones, so they can come home to a warm (unburned) meal even if they had to put in extra hours at the office. Meanwhile, Iris Care (a service from Iris Home and Security Monitor) uses cameras and motion sensors to track your elderly loved ones in their home, arming them with a wearable pendant that will alert you if they fall or otherwise require assistance. As exploration of home automation technology grows, it'll continue to provide solutions that even Luddites can't help but find attractive. The home automation market is far from reaching its peak — it's expected to grow from a $17 million market in previous years to a $36 million market by 2016. And with innovative leaders like Verizon Wireless already exploring the possibilities, home automation has a bright future ahead of it (unless you're out for a few hours, in which case the future should be dimmed at least 50%). Stephanie Georgopulos is a Senior Content Producer at Gawker Media. She tweets here, essays here, kinjas here, and tumblrs here.